Fish Fuckers – Or, a Record, Compil’d in Truth, of the Sordid Activities of the People of Innsmouth, Devon is one of those books where you ask, “Does this book really exist?” Which is the point because it was announced, released, and sold for exactly one day—Sunday, April 1st 2018. Can you say instant collectible? Sure you can! So what is Fish Fuckers? It is a scenario for use with Lamentations of the Flame Princess Weird Fantasy Roleplay, designed by Kelvin Green, the author of Forgive Us – Being A Chronicle of the Events Surrounding the Mysterious Disappearance of the Notorious Criminal Gang Known as the Tenebrous Hand. And Other Stories, set in the game’s default early Modern Period. Specifically, the 1630s of Stuart-era England, so it would work well with the aforementioned Forgive Us, as well as The God That Crawls and England Upturn’d. That said, the one scenario which Fish Fuckers has something in common with is Scenic Dunnsmouth, both being inspired by the writings of H.P. Lovecraft. Where Scenic Dunnsmouth takes its inspiration from ‘The Dunwich Horror’, Fish Fuckers is very obviously inspired by ‘The Shadow Over Innsmouth’, but instead of setting the scenario on the barely settled coast of the New World, the author shifts the action to the English county of Devon. Designed for four characters of no more than Fourth Level, Fish Fuckers is designed as a mini-sandbox, one that plays upon the perception that the inhabitants of rural villagers are inbred and insular and have a strong dislike of outsiders (see also The Wicker Man. The good one. Not the one with bees.). The player characters get to wander into the village of Innsmouth, interact with the recalcitrant villagers, get an idea that something is really wrong, poke around a bit, meet the main NPCs who might be slightly friendlier, find out what is really going on, and then… Well that is up to the players and their characters. There are story elements which the Referee can use to nudge the players and their characters, but for the most part, the NPCs and the scenario will be reacting to what the player characters do. As to Innsmouth and its environs, this is described in quite some detail. In fact, the environs more than the village itself as in some ways, as it is the least interesting location in the scenario. It is all displayed on some rather good maps. Some of these are the floor plans of random houses in the village, should the player characters decide to break (for whatever reason); others are of specific houses; and then there is the general map of the area. This depicts the village and the surrounding area and is marked with the various locations and relevant page numbers and enough information such that the Referee who has done her homework, could run the scenario from this map. That said, the map could have been a little larger to take in a couple of important locations placed slightly off the map. As well as describing Innsmouth and roundabout, Fish Fuckers details two new spells, both for Lamentations of the Flame Princess Weird Fantasy Roleplay and Vaginas Are Magic , maps a shipwreck, provides a list of names typical of the period in Devon, and provides the means to detail the homes of the things from the sea (should the player characters have the means and decide that they really, really want to go there…). Physically, Fish Fuckers is a gorgeously green and grey book. The cover manages to be both impressive and shocking at the same time, pulling, as with the title, no punches. This cover is actually embossed, and well, slightly sparkly, which combined with the heavy stock the book is printed on, gives Fish Fuckers a luxurious look and feel. This really is a lovely book in itself. Inside, the cartography is excellent, the artwork fittingly quirky, and the writing clear, if in need of a little editing. Of course, if you really are going to run this, then what you really need to do is practise your West Country accent. This should be too difficult if you are from the United Kingdom, but gamers of a certain vintage can do no better than to refer to ‘Green and Pleasant Language’, the article on ‘Mummerset’, which was cut from Green and Pleasant Land: The British 1920s-30s Cthulhu Source Pack and which appeared in White Dwarf #90. As for the rest of you, your best option is to talk like a pirate and hope that nobody from the West Country is around to listen to you mangle one of our beloved rural dialects. As to the title of this scenario, if you consider the source, H.P. Lovecraft’s The Shadow Over Innsmouth, then that title is appropriate and fitting. Whether that title is provocative is a more pertinent question and it is difficult not to see it as anything other than provocative, but then this is a book published by Lamentations of the Flame Princess. So what did you expect? 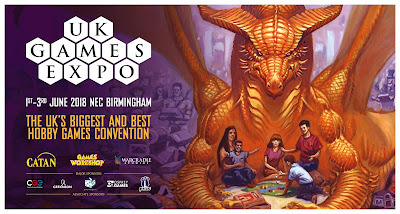 Lamentations of the Flame Princess will be at UK Games Expo which will take place between June 1st and June 3rd, 2018 at Birmingham NEC. This is the world’s fourth largest gaming convention and the biggest in the United Kingdom.